Order Pukka Elderberry & Echinacea from the Online Health Food Store UK. 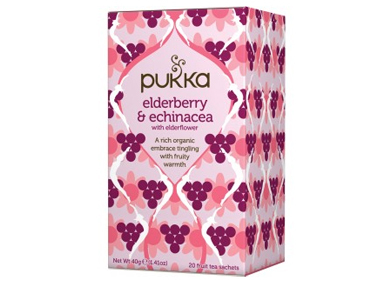 Buy Pukka Elderberry & Echinacea Tea - 20 bags and other quality Pukka Teas safely online in the UK. A rich organic embrace tingling with fruity warmth. Naturally caffeine-free and ethically sourced ingredients: Licorice root*, ginger root*, echinacea root and leaf* (10%), beetroot*, aniseed*, elderflower* (8%), peppermint leaf*, orange peel*, elderberry* (6%), rosehip*, acerola juice flavour*, orange essential oil flavour*?, natural blackcurrant flavour. *organic ingredients (99.9%). ? contains non organic lecithin. Where to buy Pukka Elderberry & Echinacea safely online? Shop at the Online Health Food Store if you are wondering where you can buy Pukka Elderberry & Echinacea Tea - 20 bags safely online in the United Kingdom. Elderberry & Echinacea - Pukka Elderberry & Echinacea Tea - 20 bags in Pukka Teas and Herbal Teas.